The community of St. Jacobs is located in southwest Ontario, just north of Waterloo in Woolwich Township, Waterloo Region. It is a tiny village with a Mennonite heritage and is a popular tourist destination - for those who know about it. The village feel and quaint shops showcasing local art and homemade products is reason enough to make a stop off here if you are in the area. Besides the shops there is a farmer’s market and The Millrace Footpath, a recreational trail that forms part of the Trans Canada Trail (known as the world's longest network of recreational trails). This company is completely and totally quintesstial Canadian, and - fun fact - it's the oldest commercial corporation in North America and one of the oldest in the world (thank you Wikipedia.) It started off as a fur trading business in the 1600s and today is a full-fledged retail store. My favourite part about it? The HBC Collection brand. Maybe it's because I don't live there anymore but my heart melts when I see anything with a blue-yellow-green-red stripe combo. If I had it my way, my room would be littered with this pattern, starting with this blanket, these mitts, this bear... I think you get the point. And, if I owned this, then my life would probably be complete. Happy Canada Day, Jay! I found your blog a couple of weeks ago, have loved your beautiful photography and description of Euro holiday destinations! Happy Canada Day!!! LOVING the olympic gear collection you posted. That beanie is to die for. i love the bay. 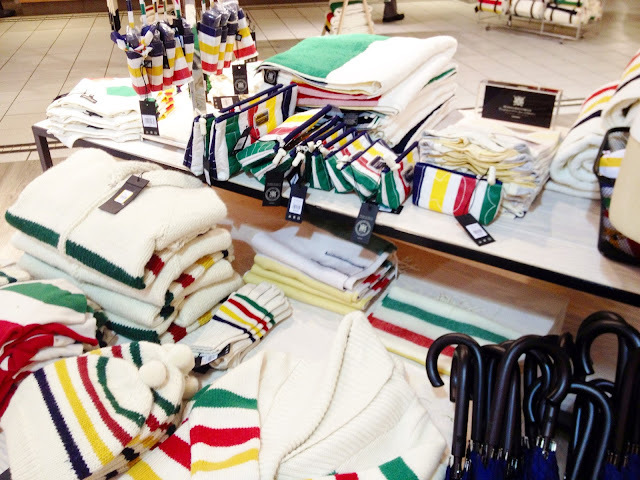 it's my dream to one day have an authentic striped blanket. my dad has one (that i hope to inherit!) but it's pretty threadbare at this point.